If you're going to release a cover version, it's always a good idea to choose a song not many people are familiar with. That way, it feels like a brand new song, and doesn't have to compete with the original in people's minds and hearts. This week in 1992, a singer who'd already remade a couple of obscure songs to great effect released the definitive version of a tune that was already quite good to begin with (not that many Australians were familiar with it at that stage, myself included). It was a much bigger hit than the two other covers debuting on the ARIA chart that week - in fact, it was much more successful than most songs the entire decade. Before long, it would replace the song that held down the number 1 spot this week in 1992. Until that happened, "End Of The Road" by Boyz II Men spent its third week (of four) on top. An improvement of 21 places for this second single from Henry's Dream, but for the time being Nick Cave was still very much a niche concern - and with songs like this, it's not hard to see why. The last time they'd been relegated to outside the top 50 had been with the fifth single from Joyride. The Swedish duo found themselves there again with only the second release from Tourism - a kind of boring ballad that was no "Listen To Your Heart". I couldn't have put it better myself - this follow-up to chart-topper "Humpin' Around" was exactly as its title described: good enough. Not a great song, but a decent LaFace production all the same, which returned Bobby to the top 50 for what would be the last time as a solo artist (although a featuring slot in 2002 would give him a final gasp of chart glory). I actually preferred "Good Enough" to Bobby's number 1 hit, but even so, it was no "Don't Be Cruel" or "Every Little Step" - and that was the problem for me with the entirety of the Bobby album. Just over two decades earlier, Jesus Christ Superstar cast member Yvonne Elliman had been beaten to the punch with her recording of Mary Magdalene's big ballad when Helen Reddy released a rival version in early 1971 and took it all the way to number 2 in Australia. Yvonne's eventually released single peaked 70 places lower. Kate Ceberano had no such spoiler to contend with, but the cast album's massive sales did stand in the way of her having a major hit with her take on "I Don't Know How To Love Him". Until a few months ago, when I recapped the debut of Sarah Brightman and José Carreras's original version of "Amigos Para Siempre (Friends For Life)", I hadn't spared a thought for this parody rendition since 1992. And I can't say I was happy to be reminded of its existence. The musical equivalent of alley cats fighting, the send-up by Norman Gunston (aka Garry McDonald) and Effie (Mary Coustas) from the recently ended Acropolis Now took advantage of the Olympics anthem being eminently send-up-able. Still, listening to it was pure torture. 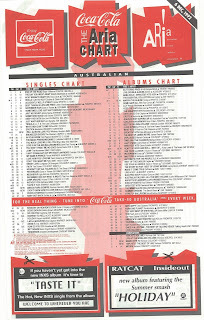 The song's short run on the ARIA chart broke a 12-year absence for Norman, who'd last charted in 1980 with "Kiss Army / Normdrum", which reached number 12, and had his biggest hit four years before that when 1976's "Salute To ABBA" peaked at number 9. There are big singles and then there's "I Will Always Love You". Chart-wise, the track taken from Whitney Houston's film debut, Bodyguard, spent 10 weeks at number 1 (the longest stretch since Bryan Adams's soundtrack behemoth the year earlier), and ended both 1992 and 1993 among the year's top 20 biggest hits. Music-wise, songs don't get much bigger than this. From its risky a cappella intro to its booming climax, "I Will Always Love You" blew every power ballad before it out of the water. It was a vocal triumph for Whitney, who'd never sounded better, and nothing at all like the understated 1974 original by songwriter Dolly Parton, whose version only charted in Australia following its use in The Best Little Whorehouse In Texas and re-release in late 1982. Whitney has intended to record a remake of "What Becomes Of The Brokenhearted" for The Bodyguard, but that plan was nixed when Paul Young recorded it for the Fried Green Tomatoes soundtrack in 1991. Her co-star Kevin Costner came up with the idea of covering the Dolly song and steamrolled resistance from Whitney's record label to the idea. Turns out he knew best. What made "I Will Always Love You" so essential, in Kevin's mind, were its lyrics. Written by Dolly about her former musical partner Porter Wagoner, the song tells the tale of someone moving on from a person they've loved, amicably and respectfully. Kind of casts its regular use at weddings in a new light, doesn't it? 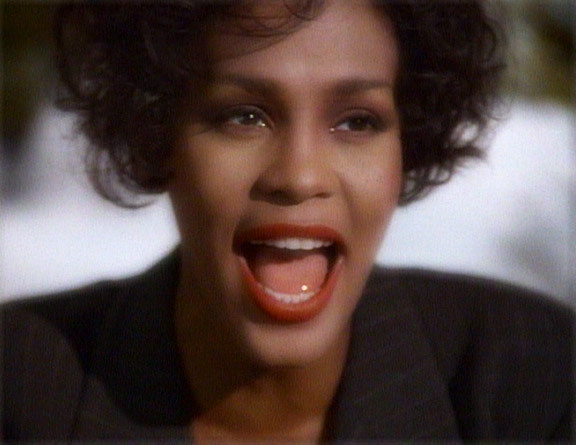 As well as its achievements in Australia, "I Will Always Love You" spent a then-record-breaking 14 weeks on top in the US, won two Grammy Awards, set up The Bodyguard soundtrack to be a phenomenal success and was the first of a string of singles for Whitney from the movie. Also, in 2012, following her death, it returned to both the ARIA and Billboard top 10, and is arguably her defining moment as a performer. Next week: five new entries - everyone of them by a music megastar. Among them, the end of an era for a pop princess, and Madonna and Prince's release schedules sync up once more. The Norman Gunston & Effie version of "Amigos Para Siempre" gets my vote as the worst song of 1992. When I saw it on the chart printout I expected a parody, but it's a crappy cover version, sung really badly. I'm no fan of the original, but even the utter dregs of novelty songs – "Stuck On Earth", "Absolutely Fabulous", "A Cuppla Days" – are better than this poxy cash-in. Since when are Norman and Effie meant to be friends at all, let alone for life? I thought there'd be more comedy value if Effie was singing this with, say, Nick Giannopoulos. It makes as much sense as a duet between Ted Bullpitt and Kylie Mole. We're ostensibly dealing with two comedians here (and I use the term VERY loosely), but there's only one funny moment ("When I look at you I wonder 'Why?!'") – what a waste. And the B-side was called "Venereal Girl". Drear oh drear. My god, what a load of crap that Norman Gunston/"Effie" song was. Right up there with the Macarena and bloody Love Shack as the worst song of the '90s in my opinion. I've never heard of any of the other debuts this week except that rubbishy Bodyguard song!! I'm glad someone else can't stand Nick Cave and how he is revered as some sort of musical demigod by the likes of rage/Triple J programmers. If my memory is correct, 'I Will Always Love You' was one of only two singles certified 4x platinum by ARIA in the 1990s; the other being 'Mambo No. 5'. Had there been a decade chart for the 1990s, 'I Will Always Love You' may well have taken the crown; assuming there was a fair correlation between shipments and sales, and there was no major under-certification of 3x platinum-certified singles. I only remember hearing 'Queen of Rain' on UK Chart Attack, so am not surprised it flopped; though I like it. 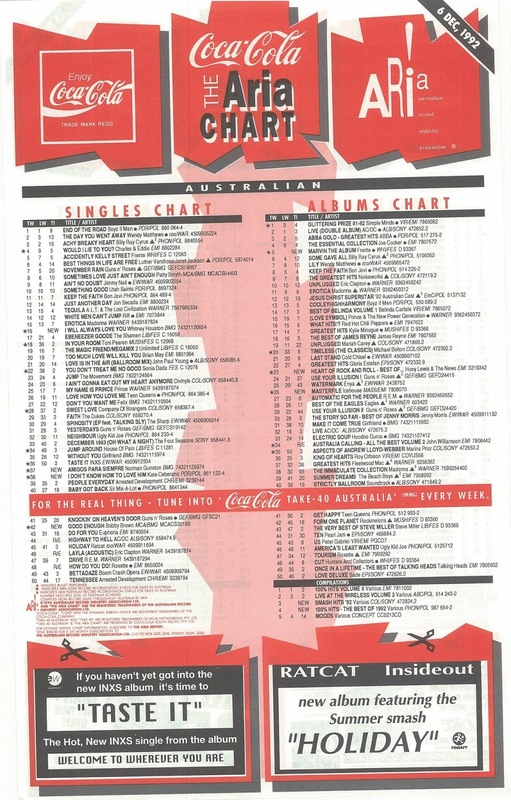 This peaking at #66 was a sure sign that Roxette's days as a chart force to be reckoned with in Australia were nearly up. I didn't care much for either 'Good Enough' or 'I Don't Know How To Love Him'. The less said about 'Amigos Para Siempre', in either version, the better. There certainly was some awful chart music here in late '92 extending well into '93. Don't forget about "Candle In The Wind 1997". Mambo No.5 went 4x platinum? How depressing. 'Candle In the Wind '97' doesn't exist in my world. I've never heard the whole thing once, and intend to keep it that way. How funny that I forgot about it.